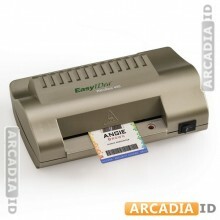 ArcadiaID utilizes ID card laminators to make ID cards at home that are professional quality. The miniature id laminator or laminating machine is specifically designed for ID lamination, and comes standard with every [email protected] ID Card Kit. An ID laminator laminates your identification cards to give a professional PVC ID card quality. ID laminators are quick and easy to use. The laminator is warm and ready for ID card lamination in just three minutes and is compatible with magnetic stripe encoders. The laminator allows for 2 hours of continuous use and is equipped with a thermostat shut-off for added safety. The ID laminators supports ID cards up to 4.5” wide, and up to 32 mil thick. In addition to laminating ID cards, the id laminator can also laminate photos. An ID card laminator is just another aspect of the [email protected] ID kit offered by ArcadiaID that will enhance your business and create professional ID cards.